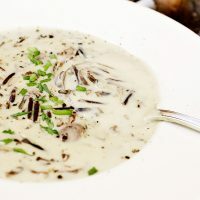 A delicious, classic pairing of wild rice and mushrooms, in a creamy broth. Hearty enough for a dinner soup or an excellent starter soup. In a large pot, bring stock and rice to a boil over medium-high heat. Reduce heat to medium, cover and cook, stirring once or twice (just to make sure there is no rice sticking to the bottom of the pan), for 40 minutes. Add shallots, stir and continue cooking, covered, until rice is tender, about 5-10 minutes more (a taste test of a grain or rice is the best way to check. Be sure it is tender before adding the cream). In a small bowl, whisk together the cream, flour, thyme and pepper. Add to soup, along with the sliced mushrooms. Lower heat to medium-low. Cook, uncovered, stirring, until soup thickens, about 15 minutes. Stir in maple syrup. Taste and add salt and pepper, to taste. Garnish with chives. If soup is too thick (or you've made it ahead and it has thickened, simply thin with a bit more chicken stock and/or cream.) Serve garnished with some chopped parsley or chives.